To judge from the number of versions and copies that are known, Domenico Fetti’s cycle of the Parables, executed between 1618 and 1621, was one of his most popular creations. The series was painted to decorate a room known as the Grotto of Isabella d’Este in Mantua. The commission relates to Fetti’s period in that city and particularly to his association with Ferdinando de Gonzaga, whom the artist had met in Rome when Gonzaga was a cardinal and for whom he continued to work when Ferdinando became the 6th Duke of Mantua in 1613. As court painter in Mantua, Fetti executed various works for local churches and a number of cycles for the ducal palace. It is generally considered that his series of Parables, whose originals are now divided between museums and collections, was one of his most original contributions. The present two panels entered the Thyssen-Bornemisza collection in 1979 but have different provenances and have also been the subject of differing opinions as to their attribution. The Good Samaritan, whose prototype is considered to be the painting now in the Gemäldegalerie, Dresden, has been considered a workshop production. The Dresden painting has a horizontal format and is set in a broader landscape that includes classical ruins on the right. The Accademia in Venice has a version considered to be autograph with a setting close to that seen in the present panel. Other paintings on this subject by Fetti are to be found in The Metropolitan Museum of Art, New York, the Museum of Fine Arts, Boston, and various private collections. A drawing of the central group with the two figures is in the Musée du Louvre, Paris. 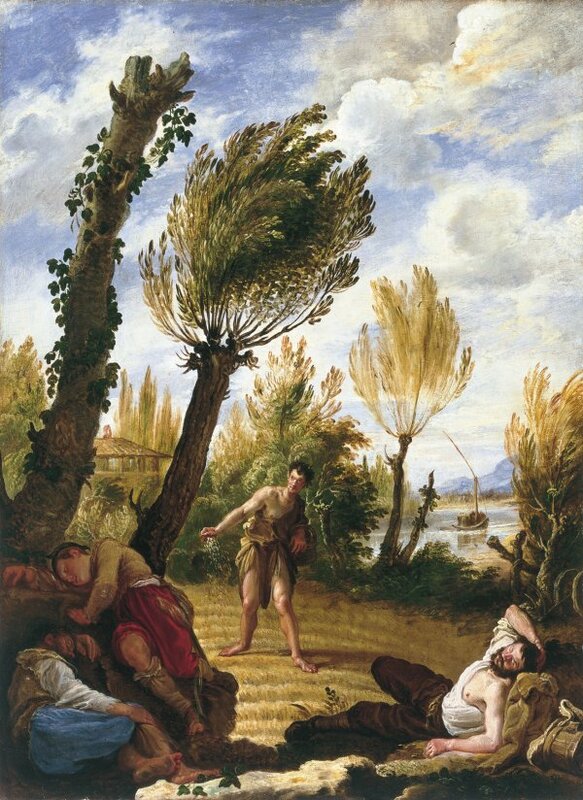 In contrast, the panel with the Parable of the Weeds is considered an original work by Fetti whose prototype is a painting now in Prague castle. Like The Good Samaritan, copies are to be found in museums and private collections. Both parables, which are among the most widely known and most depicted in art, are recounted in the Gospels. The first was commonly used to symbolise charity and love of one’s fellow man, while the second represented the reward for good deeds and punishment for bad ones. The seed of evil is sown by the enemy, the Devil, whom Fetti depicts as the sower with his pointed ears and small horns, taking advantage of the labourers’ rest to propagate evil. Despite the involvement of the workshop in one panel, these two works fall within Fetti’s mature period and reveal a freedom of brushstroke in the elaboration of the figures and particularly in the landscape backgrounds. The distinctive presentation of the striking trees with their trunks, branches and leaves painted in dark tones outlined against bright skies and occupying an important position in the two compositions, is one of the artist’s most notable achievements.